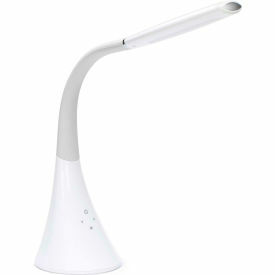 Innovate new ways to light your desk with OFM’s Core Collection 4010 Contemporary LED Desk Lamp Light. Inspired by the minimalist school of thought, this cool and contemporary desk lamp will bring style and brightness to your desk and provides 400 lumens of bright light. The simplistic style of this light combined with the gooseneck grip, and detachable cord allows the light to move around easily in any direction. 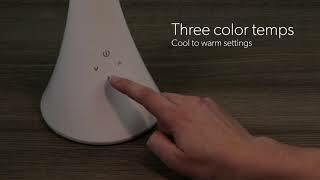 This lamp comes in four levels of brightness, and 3 color temperatures (3000K, 4000K, 5000K). Thoughtfully crafted this LED desk lamp also comes with a USB charging port. Available in white and black, this lamp will truly harmonize seamlessly with any décor. Height of lamp 23.5" with extension from the center of the base 13" . Greater than 20,000 hours of light with a power consumption of 19.5 watts.